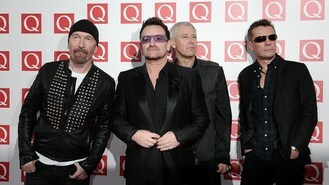 U2 manager Paul McGuinness is on the verge of stepping aside after 35 years at the helm of the world famous band. The unofficial fifth member of the Irish rock group is also close to selling his management company, Principle Management, to Live Nation Entertainment. McGuinness said was delighted that Live Nation has joined him in creating a powerful new force in artist management. "It could be seen as slightly poor etiquette for a manager to consider retiring before his artist has split, quit or died, but U2 have never subscribed to the rock 'n' roll code of conduct," he told the New York Times. "As I approach the musically relevant age of 64 I have resolved to take a less hands-on role as the band embark on the next cycle of their extraordinary career." McGuinness has managed U2 since 1978, two years after four Dublin teenagers - Paul Hewson (Bono) on vocals, David Evans (The Edge) on guitar, Adam Clayton and Larry Mullen on drums - formed a band. He founded Principle Management in 1982 and became one of the most highly-rated executives in the music business. His client list also included PJ Harvey, The Rapture and Paddy Casey. Under his control U2 sold in excess of 140 million records and won 22 Grammy awards. Live Nation, which owns Ticketmaster, is also in talks to buy Madonna's management company Maverick. The move will result in Madonna's manager, Guy Oseary, taking over the management of U2 and day to day running of Principle, while McGuinness will become chairman of Principle Management. Live Nation is due to issue a statement on the deal, which is an estimated 30 million US dollars (22.3m euro / £18.7m). A £36,000 bill charged by Van Morrison's band to play at a concert where he will be awarded the Freedom of Belfast has been defended by the star's company. Sir Cliff Richard has recalled how a young Prince Harry once accompanied him by singing into a chocolate bar. David Bowie has released a second, more lavish video for his latest single. Lily Allen has hit back at accusations of racism over her video for comeback single Hard Out Here. Britney Spears has recorded a duet with her little sister for her new album. Eminem's manager Paul Rosenberg has opened up about the rapper's battle over his addiction to prescription drugs. Lady Gaga has hit out over her supposed rivalry with Madonna, insisting "I don't want your throne". Van Morrison's band is being paid £36,000 to perform at a concert in his home city where he will be awarded the Freedom of Belfast, it has been revealed.